Whether you are an aspiring Notary, a newly commissioned Notary, or a currently active Notary, you will find our website and services, as well as, supply offerings useful in your official practice. We are a Texas based service located in Austin and appreciate your patronage. Advisory:……Out of State Companies-pretend to be local and solicit business using UPS Box mailing address in their notices! Renewal Notices are issued 90 day prior to commission expiration by this Bureau! The Texas State Notary Bureau has over 34 years of experience working with Texas Notaries. It core roots of inception stem from our Director’s service in the office of the Texas Secretary of State. Our Director and Founder, F. Henry Garcia, was appointed by Secretary Strake, as Texas Notary Director of the Notary Public Division. From that time, he has spearheaded numerous changes in the notary law arena and was instrumental in securing passage of bills which mandated distribution of commission education materials, the requirement for personalized notary seals and changes to the fees that Texas Notaries can charge for notarial certificates. The prior fee statute, dating from 1876, mandated fifty cents (.50). From the beginning, we have been instrumental in bringing attention to Notary Publics and their service role as a constitutionally mandated public official. 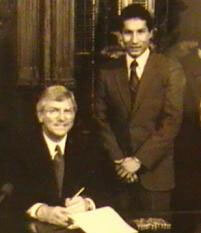 Picture: Governor White and F. Henry Garcia at signing of bill which implemented major Texas Notary law changes. A Texas-based organization, the Texas State Notary Bureau is dedicated to educating, assisting and providing consultation services to Texas Notaries. To that end, we specialize in reviewing issues and activities that impact you and your practice as a Texas Notary, such as application revisions, appointments and renewals, complaint notification procedures, proposed legislation, law and rules changes, in addition to the many other areas that affect Texas Notaries. For over 34 years, our Founder, has conducted notary education seminars and training sessions. Our seminars are currently offered in conjunction with the Austin Community College program. We use our understanding of Texas laws to provide our members with up-to-date information on the major changes approved by the Texas Legislature. The Texas State Notary Bureau is uniquely-qualified for this purpose. Bureau President, F. Henry Garcia, is a former Texas Secretary of State Notary Director and Staff Attorney. He has supervised the issuance of over 470,000 commissions, and provides notaries with a rare insight into the processes of Texas government. For current Texas Notaries, looking to renew their commission, the Texas State Notary Bureau offers a simplified state-approved renewal appointment process which makes it easier to re-qualify as a Texas Notary. The recently revised and updated application form, the $10,000.00 bond, and the required official supplies, have been combined into specially-discounted notary package. Note: Forms are now Electronically filed for faster service! NOTICE: Renewal forms are not sent out by official state agency! For persons wishing to become a Texas Notary, we offer a straight-forward and state-approved appointment package that makes becoming a Texas Notary simple and convenient. We take care of all the requirements: the bond, filing fee, seal of office and record book/journal. On stop shop! Note: Forms are now Electronically filed for faster service! We offer official seals, stamps, embossers, journals, decals, fee charts, and education materials in all of our various supply packages. All seals are personalized with your notary commission name and expiration date, as required by current Texas Notary law. We guarantee all products and services, and provide a toll-free Hotline phone number for Texas State Notary Bureau clients. Founded by former Texas Notary Director, F. Henry Garcia, the goal of the Texas State Notary Bureau is to meet the needs of Texas Notaries in a professional and courteous manner. As the only original Texas-based notary service organization, we accomplish that mission, plus offer our clients the most accurate and complete services in the state while providing a unique insight into Texas laws governing Notaries. Welcome to our website. We believe you will find it useful. If you need help with any Texas Notary-related issue, please contact us. We would consider it a privilege to work with you.